To say that I have a tahini obsession might be a little bit of an understatement. I can’t get enough of that delicious paste that lends itself equally well to both sweet and savory flavors. I want to put it on everything. And possibly take a bath in it. Too far? If you’ve never had tahini, do yourself a favor and pick up a jar (it’s by the nut butter). And then proceed to become as obsessed as I am. Lately I’ve been loving tahini in oatmeal (surprise – what do I not love in oatmeal?). And I’ve especially been loving it with maple syrup in oatmeal. Ever since I made these addictive maple tahini cashew clusters, the maple-tahini flavor combo has been stuck in my head. 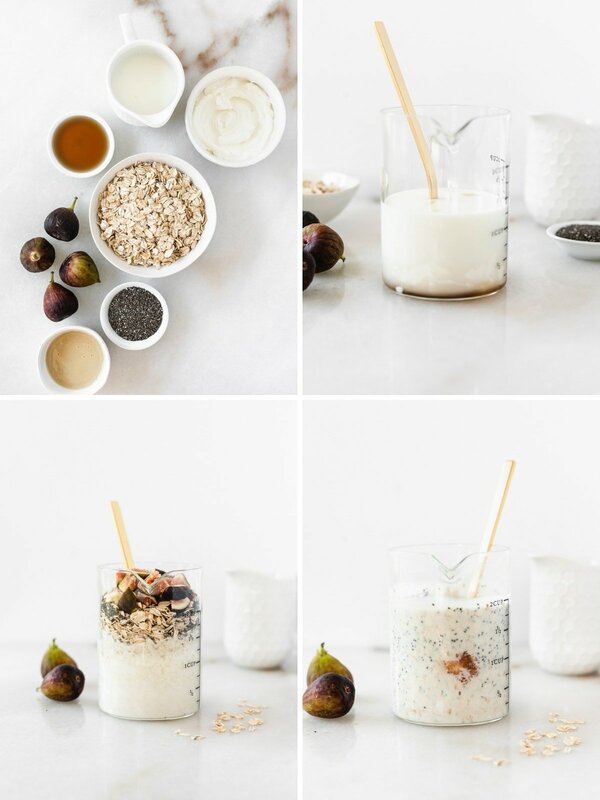 And I’ve been dying to make ALL the maple tahini things! But, you know, there’s the whole new baby thing, so overnight oats is about all that I can accomplish most days. 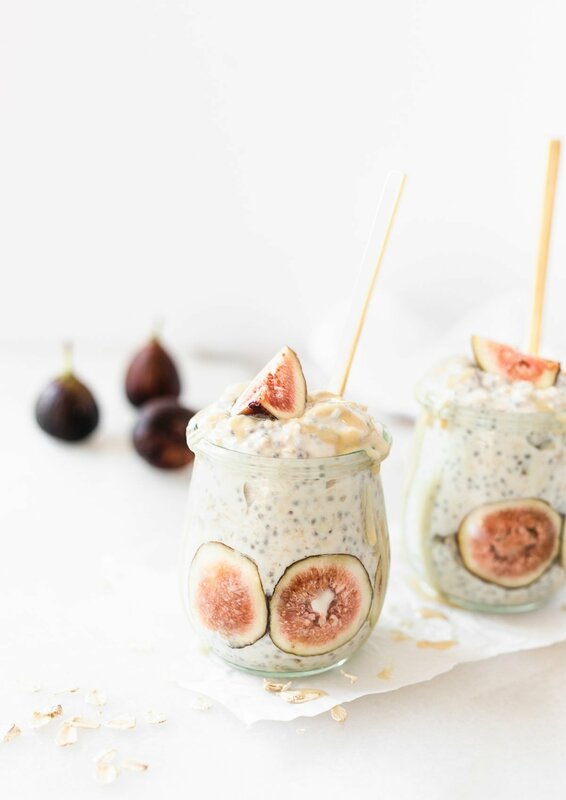 So these maple tahini fig overnight oats were born. What better place for maple and tahini than in easy to make overnight oats? And with gorgeous fresh figs? Shut up. 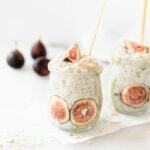 Maple tahini fig overnight oats are the perfect breakfast to help you transition into fall, just in case you’re like me and aren’t quite ready to go full-on pumpkin spice everything yet. I like to ease myself into fall with some nice September figs and a little maple syrup. And since it’s still almost 100 degrees in September here in Texas, something on the cold side is nice, too. 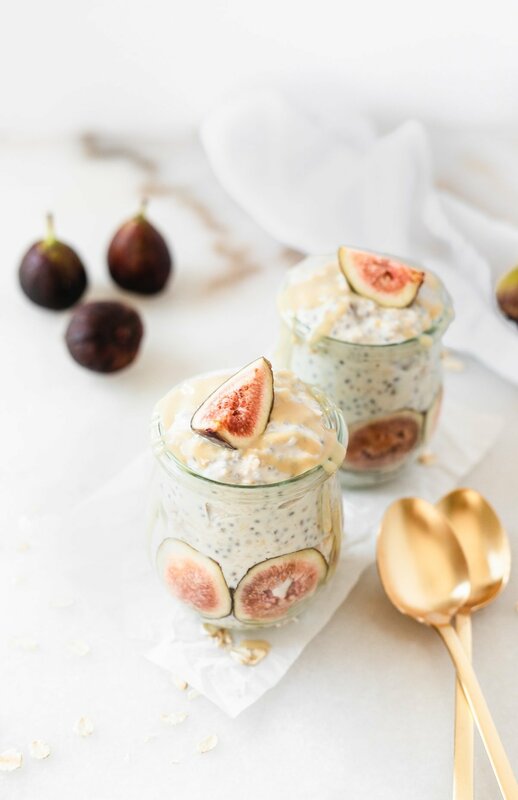 So maple tahini fig overnight oats are the perfect answer! They’re healthy, filling, delicious, and super easy to make ahead. What more could you ask for in a breakfast? In a jar or other container with a lid, whisk tahini, maple syrup, yogurt and milk. Stir in chia seeds and oats. Cut figs into quarters and add to jar. Stir to combine. Place lid on the jar and refrigerate overnight or at least 6 hours. Give it a stir in the morning and enjoy! *I use Chosen Foods chia seeds. Use code LIVELYTABLE20 for 20% off your order!